Though I can by no means claim singular credit for the enormous success of the Chestertown Wizard summer camp for three years that it ran. I was integral not only in the design of the camp and of the storyline, but also in the execution of several performances, video productions and lesson plans that went along with it. 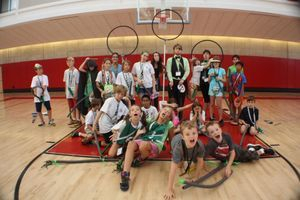 I was brought in specifically to craft an original interactive story for these students that would engage them and make them feel a part of the Harry Potter universe. This required a knowledge of how the story would be received, what would interest the children and organizing and planning live performances, interactive characters, games, events, and video productions. By all accounts the camp was a huge success growing larger and more in demand each year until it was finally cancelled by the sponsor and could not be continued. The Movie on the Mall was a pet project through the Residence Hall association. We arranged to use the funds we had gathered to pay for a giant projector screen to be put up on the lawn of our university. Students were invited to come and watch Inception on a giant screen right outside their dorms. The event took months of planning and organizing and advertising but was incredibly well received and brought in hundreds of students. Along with the movie we had several activities and entertainments including sparklers candles and huge bags of ball pit balls. 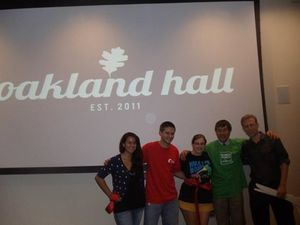 The opening of Oakland hall was a huge event for the Residence Hall association and as president I was asked to plan not only the event but also a subsequent celebration in honor of the hall. My speech was considered excellent and I was actually personally congratulated by University of Maryland President Wallace Lowe as pictured to the left. The celebration was also a huge success and involved music, video and several costumed characters. Elegant holiday was the brainchild of a close friend of mine. 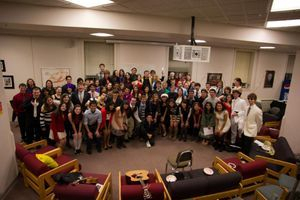 It involved a holiday celebration where artists from various places were brought together to share in the music and company of one another. This event was incredibly popular and happened for several years after the original. Planning involved complicated scheduling, advertising, and coordinating with huge amounts of talent and their supplies. 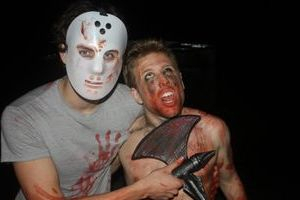 Horrorquest was a huge endeavor that took place all across the university of Maryland campus. Actors were placed at supposedly haunted locations and several teams were led across campus via clues placed in social media and on internet sites and even in fake newspaper articles. The event was a huge success and I was asked to do it again for the following two years. This event involved a huge amount of coordination of talent, gamelike mechanics, and also video performances. Unfortunately due to the nature of the event we were not able to get many photos and the ones we got were very dark and unclear.